The computer motherboard is the central component bringing all your individual components together. Whether you building a PC with Intel or with AMD components, selecting the best motherboard to house your choice of PC hardware is crucial. Filter down and compare the best motherboard prices on ONESHOP to get the best deal. The main circuit board or motherboard is the most important component of any computer system, other pieces of internal hardware are unable to function without a motherboard connecting all the pieces together. The motherboard holds all the most essential components like the CPU, memory modules (RAM), graphics cards, etc and provides electrical connections for external input devices like the mouse and keyboard. The configuration of a motherboard is a simple large flat surface; rectangular in shape and lightweight (getting heavier as more components are added). The main board is located inside the computer case/tower and is usually the first piece to be installed when upgrading a computer. In earlier times, computers were built in long flat block-like cases with components connected to a backplane. This was a very unpractical way of manufacturing computer systems because several backplanes was needed to create one complete computer, thus resulting in high cost and extreme overheating. During the late 1990s loose backplane components where moved to a single "mother" board, making it more economical and practical for the manufacturing companies. In later years, more peripherals and parallel ports were added by means of single ICs chips; also supporting a host of interfaces, buses and external components; hence calling it the motherboard chipset. The most basic definition of a motherboard is that it contains the computer's processer and other vital PC components that works together to make the computer run. The form factor can be simply defined as the physical shape and size of the motherboard, it's very important to know a few basic facts about motherboard form factor types. When buying a motherboard, CPU or computer case, please consider the form factor (size) on which your motherboard will "fit" inside the case to prevent buying incompatible components. 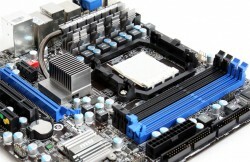 There are three popular motherboard form factors used today; ATX, BTX and Micro-ATX. See OneShop's Computer Case buyers guide for more info on the case form factors. OneShop's motherboard category page has the best info on current motherboards, useful filters and the best pricing of expert online retailers. Remember, if you considering an ATX motherboard for example, be sure to purchase a ATX power supply and compatible processors or memory modules (RAM). Read product specifications or contact your desired manufacturers for more information.